Mashrou‘ Leila are one of the most controversial bands in the Middle East. They started in 2008 as a student band at the American University of Beirut. Soon they became famous and loved for their indie-rock mixed with Arab features, and for their courage: Mashrou’ Leila’s front man is gay, and he speaks out loud, regardless the difficulties and obstacles he has to face. In the Middle East sexuality is a taboo, nobody talks about it, and homosexuality is even worse. On the one hand, Lebanon is the most liberal country in the Middle East and a lot of gays are well known and recognized as artists and designers, on the other hand, Lebanese law still defines homosexuality as a crime. So Mashrou’ Leila on stage! A must see! Some days later, I noticed new posters on the walls: same style, same date, but different band. “Who Killed Bruce Lee vs. Mashrou’ Leila” was soon announced everywhere. Lebanon’s first Sound Clash was supposed to take place. A Sound Clash? Last Saturday, Nov 23: I found myself together with a huge crowd of young people in the middle of two stages at Forum de Beyrouth. On the left stage Who Killed Bruce Lee started the performance for the night with three of their original rock songs. In the meantime on the right stage Mashrou’ Leila got ready to take over and to accept the challenge. It was the warm-up round for all of us: the bands and the audience. Our task was to judge. Who of the two would be the champion of the evening? After every challenge we had to applause and scream. Above us hang the incorruptible “referee”, a microphone recording our decibels. 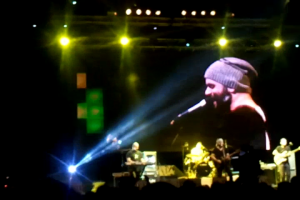 The sympathies of the audience flew immediately to Mashrou’ Leila as soon as they played their first chord. But a real competition didn’t come up. Both complimented the other, and said it was an honour to compete with such a brave opponent. This was more than just Arab politeness! Loud laughter filled the air as we learned about the night’s first challenge, “The Cover”. Both bands had to cover Britney Spears’ “Toxic” and mix it with their own style. Let’s put it that way: Britney Spears is as far away from Mashrou’ Leila and Who Killed Bruce Lee as Berlin from Beirut. But both did a good job. With Who Killed Bruce Lee’s rock version the song became danceable and even interesting. And Mashrou’ Leila added a new tune to it, with the violin. Challenge 2, “The Take Over” was even more astonishing: Each band had to play one of their original song and the opponent had to take over, adopting the song to the own style. With each take over the language changed, since Who Killed Bruce Lee’s singer prefers to sing in English, whereas Mashrou’ Leila front man turned the English rock into Arabic. “The Clash” was the motto of the third challenge. Both bands had to implement a certain style to one of their own songs. So why not adding a bit of reggae to Mashrou’ Leila’s Arab indie? The whole evening was an attack on the risible muscles, a surprise for every ear and I came to the conclusion, that in music nothing is impossible. For the last challenge both bands could play a “Wild Card”, and Who Killed Bruce Lee performed with the flautists of the Lebanese Philharmonic Orchestra. The ovations didn’t stop for minutes. Remains one question: Who won the Sound Clash? None of the bands! We, the audience, were too loud for the decibel analyser. 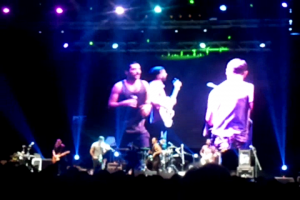 Therefore, the final song Mashrou’ Leila and Who Killed Bruce Lee jammed together on one stage!